Kingdom State Villas was established way back in 1997 by two British businessmen who had purchased property over in the Orlando Disney area of Florida. The company has now grown substantially over the years and now have over 130 properties. They teamed up with an American licensed real estate broker so they can offer personal quality advice on Florida property sales as well as property management. Since Kingdom State Villas started out in 1997 they have sold over 500 properties to clients from all over the world. The primary reason for the company's formation was that during the purchase and occupation of their own Florida villas, both directors experienced numerous problems and setbacks. They felt these problems could have been avoided had they been in closer control. So by combining their knowledge of normal everyday business sense, they can now offer you all their experience whether you are renting, buying or managing a Florida holiday villa. They also offer a superb in-house management company, who will attend to the villas and look after guests while holidaying. Kingdom State Management Company will protect your investment, and help maintain the villas to the highest possible standards. Kingdom State Villas have also negotiated discounted Car Hire and Travel Insurance through their working partners. Where are Kingdom State Villas based? Which areas of Florida does Kingdom State Villa offer holiday homes in? 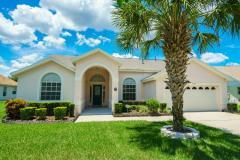 We offer villas in the Orlando area and the Gulf Coast. Why should I use an English company to book a Orlando holiday villa? With the power of the internet in this modern world Kingdom State Villas receive enquiries from all over the world, they have had clients Australia, China, Hong Kong, Eastern Europe, Central Europe, South America, Iceland and of course North America & Canada to name but a few. So really it does not matter where in the world they are based, as previously mentioned they are owned by British citizens so I suppose the U.K. is the natural place to be located. Kingdom State Villas obviously does have an office over in Orlando which is where all the vacation homes are located the purpose of this office is to look after the day to day running of the properties and they are available 24/7 to handle any problems should they accrue in any of the homes or with any of the guests. So bookings are handled from out U.K. office where all the staff have first-hand knowledge of every property and they are available 12 hours a day 7 days a week. Kingdom State Villas have been renting property over in Florida since 1997. I would like to talk to someone before booking my Florida holiday home. Can I do this with Kingdom State Villas? We have expert staff who know all the villas personally and they will be happy to answer any questions that you may have regarding location, equipment, accessibility or anything else that you might want to know. Kingdom State Villas don't do allocation of a villa on arrival, the property you choose is the property where you will stay for the duration of your vacation. Choosing your accommodation is a very personal thing, you work very hard all year round so when your away you want to have everything the way you want it. Not everyone has the same taste in furnishing or decorations so by looking through all the different homes I am sure you will see the property that's perfect for you. How many Orlando holiday villas do you have on your books? Kingdom State Villas have over 130 villas to choose from. How many bedrooms do your villas have / how many people can stay in your villas? We have villas and apartments raging from 2 to 8 beds and sleep from 2 to 14 people. I am not sure what property will suit my need best - can you advise? If you are not sure what size property you require please let us know and we will be happy to advise. You can either email on info@kingdomstatevillas.com or telephone on 44 (0) 113 289 3738 where someone will be available to help assist you. How often are the villas checked? Who handles the villa management? All our villas are checked before each guest arrives and then again after each guest departs. Each and every villa has it's own local Management Company taking care of the villa and it's guests. Can I see testimonial from previous Kingdom State Villa customers? Please see our Testimonials from satisfied customers. What are the key tourist Florida tourist attractions? Florida's key attractions are in the Orlando area the home of Mickey Mouse WALT DISNEY WORLD, which consist of 4 large Theme Parks, Magic Kingdom, Animal Kingdom, Epcot & MGM Studios, then you have the world famous Universal Studios coupled up with one of the latest White Knuckle ride Theme Parks Islands of Adventure. Also in the Orlando area you have Sea World and Discovery Cove, this is where you can swim with the Dolphins, GatorLand, Ripley's Believe it or not, Church Street Station, Harry Potter, Avatar, Lego Land to name but a few. Florida also has some of the worlds most beautiful beaches on either of the coasts, this is an ideal location to explore the Florida Everglades as well. With Orlando being located in the center of Florida it is probably the best place to be based so you can explore both the Atlantic and the Gulf coast beaches. I am planning to go to the major theme parks and/or other attractions in Florida, should I pre-purchase my tickets before travelling? Yes, we would definitely advise you to pre-purchase your Orlando attraction tickets before you go to Florida. This is because you are guaranteed to save lots of time and money compared with paying for tickets on the day at the gate. We work closely with Orlando Ticket Deals and highly recommend them for your next Orlando attraction ticket purchase. To find out more about pre-purchasing your tickets and the Orlando theme parks Click Here. As most people plan their Florida vacation well in advance it is advisable to book your villa as soon as possible to avoid disappointment. Orlando seems to be a place where families and friends visit together in large groups taking advantage of the 5, 6, 7 and 8 bed villas that are on offer. Some clients book 2 years in advance so they don't miss out on the property of their choice, there are thousands of seats on airplanes flying from all over the world to Florida but there is only one 934 Lake Berkley Drive or one 946 Cassia Drive so book your villa as early as possible so you have the best choice of property and you don't miss out on the one you like. If you book early and you need to change your dates slightly then we should be able to do this no problem. What do I need to do to book a Florida holiday house through Kingdom State Villas? All that is needed to reserve one of our villas is GBP 150 (USD 250) per week deposit and the balance is to be paid 8 weeks prior to your departure. We take all major credit cards, cheques, PayPal or you can do a bank transfer. Read our Terms & Conditions. What are the prices of your villas? Prices start from GBP 400 (USD 600) per week. We do however always have late availability deals on offer if any of the properties are still available. A refundable Security Bond of GBP 250 (USD 400) per booking is to be paid along with your final balance. After you have vacated the villa and the villa has been inspected by the Management Company providing no damage has been inflicted the Security Deposit will then be returned to you within 14 days. Read our Terms & Conditions. Can you help me sort out flights, insurance and car-hire for my Florida holiday? Will I need a visa for Florida? What visa will I require? I own an Orlando holiday villa. Can you handle its management and letting? Yes, we can handle property Management and letting, we have our own Management Company to look after all our villas and we also offer a comprehensive letting service. The Florida weather is hot all year round the average temperature from January through to April is 22c, May through to September average around 30c and October through to December averages around 24c. Florida does have a rainy season which starts around June and goes all the way through to September, humidity is also high around this time. Why should I chose a villa holiday in Orlando, Florida? By booking a private Florida villa you have the home from home comforts, privacy and taking things at your own pace, ideal for families and groups of friends, you can eat when you want, you park your car right outside the villa, our villas offer the flexibility and the freedom to come and go as you wish plus they all have a private pool. The Orlando area offers so much for every age group whether it be relaxing round your quiet villa swimming pool, exploring the wonderful beaches of the Gulf or Atlantic coast or the excitement of all the Theme Parks. Orlando has some of the best Golf in Florida with over 50 wonderful courses to choose from. If its shopping you want then look no further, Orlando has plenty of wonderful shopping Malls and Plazas so take advantage of the very low prices and kit out your new wardrobe. So whatever you are looking for Orlando has it and staying in one of Kingdom State Villas superb luxury villa allows you the flexibility to enjoy Florida.